Our GCLP compliant RNA-seq data has been used by researchers around the world and complies with rigorous quality assurance (QA) standards needed for clinical trials in the US. The data below demonstrates the large dynamic range and high fidelity of our processes. ERCC spike-in control, which provides a standard of different length RNA controls, was added to total RNA samples prior to processing using Otogenetics’ standard operating procedures for our various cDNA synthesis workflows with Illumina library preparation. 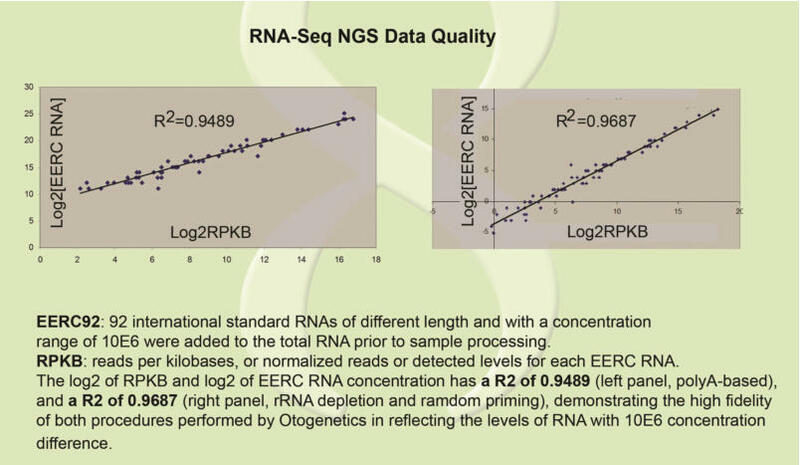 RNA across different samples exhibit a high correlation value between the concentration of the ERCC RNA control and the normalized sequencing reads, demonstrating high fidelity and repeatability of the procedures performed by Otogenetics. ERCC: Set of 92 synthetic, unlabeled polyadenylated transcripts of various lengths with a concentration range of 10E6 were added to the total RNA sample prior to processing. This RNA control was developed by the External RNA Controls Consortium (ERCC) and NIST (National Institute of Standards and Technology). RPKB: Reads per kilobases, or normalized reads or detected levels for ERCC.